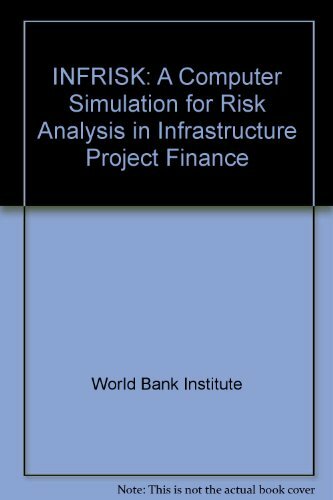 'INFRISK' is a flexible computer risk analysis approach to infrastructure project finance transactions. Developed by the World Bank Institute, 'INFRISK' is a powerful tool for quantitatively measuring and analyzing project risks, and also can serve as a training for raising awareness and building expertise in the application of modern risk management techniques. With a user-friendly interface, 'INFRISK' can analyze the exposure to a variety of market, credit, and performance risks from the perspective of key contracting parties (project promoter, creditor, and government) for both the construction and the operation phases of a capital investment project. The output includes deterministic scenario analysis, probabilistic simulation, and multi-period Value-at-Risk analysis for key decision variables, such as net present value, internal rate return, debt service coverage ratio, and government tax revenues. Drawing on recent developments in the literature on project evaluation under uncertainty, the program enables the use of a broader set of probability distribution (uniform, normal, beta, lognormal, student (t), and Bernoulli) in conducting Monte Carlo simulations rather than relying only on the commonly used normal distribution. 'INFRISK' works in conjunction with Microsoft Excel 97 or higher. A Getting Started booklet is provided for instruction on the use of the software.